Hundreds of girls and women, many bewildered and traumatized, are being registered, fed and given medical care in their first day out of Nigeria's war zone. 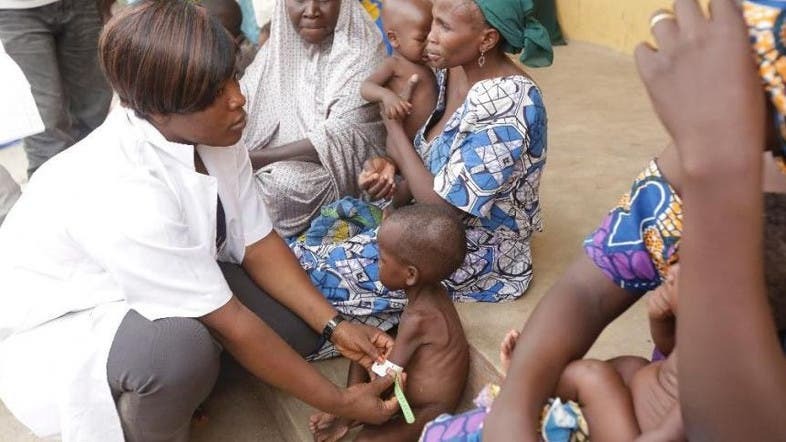 The group of 275 women and children are among the nearly 700 freed in the past week by the Nigerian military from Boko Haram extremists and the first to be transported to the safety of a Malkohi refugee camp here in Yola in the country's northeast. Officials on Sunday are still registering the 61 women and 214 children, almost all girls. Many critically malnourished babies and children have been put on intravenous drips in the clinic and 21 have been hospitalized for gunshot wounds and fractured limbs, said a camp official. Through interviews the officials are trying to determine where the women and children are from. It does not appear that any of those released are from the group of more than 200 schoolgirls kidnapped by Boko Haram a year ago from the town of Chibok, said an official. "Based on registration we have carried out so far, none of them is from Chibok," said Zakari Abubakar, Malkohi camp team leader for the National Emergency Management Agency. Almost all are from Gumsuri village near Chibok and which had been attacked many times in the past year, said Abubakar. The women and children were rescued by the military from the Sambisa Forest, the last stronghold of the Islamic extremists, and had to travel for three days on the open backs of military trucks to reach the safety of Malkohi Camp. The Nigerian military said the women and girls were freed when soldiers destroyed more than a dozen insurgent camps. Saturday night when the women arrived at the camp, they appeared exhausted and too distressed to realize they were safe, or to be questioned about their experiences under Boko Haram. They lined up for tea, water and a stew of baobab leaves. They were taken captive when Boko Haram had seized a large swath of northeastern Nigeria last year, declaring it an Islamic caliphate. Nigerian troops ran away before their advance, complaining they were not given enough ammunition or food to fight, and leaving civilians with no defense against an uprising that killed as many as 10,000 people last year. Some 1.5 million people have been driven from their homes. The tide has turned in the past nine weeks with a new infusion of armory including helicopter gunships, and a coalition with neighboring countries that brought in troops from Niger, Chad and Cameroon.